Some of the audience of this blog might not realize this, but we as Premier Developer have a presence in a lot of different industries, retail, health care, insurance, financial, energy, public sector, and many more. I spend a lot of time supporting organizations in the public sector, specifically the Department of Defense, and they come with their own set of security requirements. While the most recent issue I encountered is by no means new, and the work-around is tried and true, I wanted a better way of doing business. Specifically, when you download your Git client it comes with a ca-bundle.crt file that contains root certificates from a lot of different Certificate Authorities (CA’s). 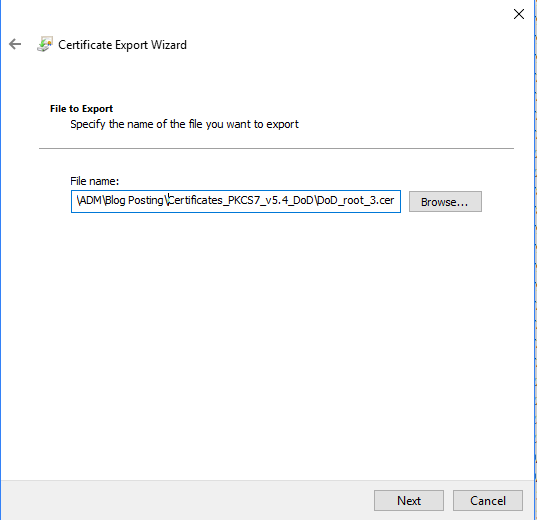 What is not included in this bundle is self-signed certificates, corporate certificates, or more widespread certificates, such as the DoD Root Certificates. This will occur through the CLI. The simple, ‘tried and true’, solution to this issue is setting sslverify=false. 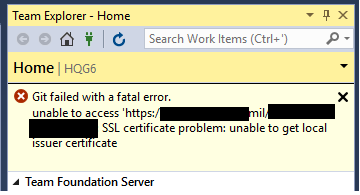 At that point, certificate revocation is no longer checked, and in my mind, opens up another attack surface. In an effort to provide a more legitimate capability, myself and a coworker repurposed another blog posting for our needs. The result is the ability to check revocation against DoD sites very easily. You can follow the instructions below, or jump to the end and download the new ca-bundle.crt and instructions. Also see troubleshooting steps for credential manager and agents if you experience issues there. Scroll to the bottom and select For DoD PKI Only – Version 5.5 (or most current). Install the .p7b files for CA_2, CA_3, and CA_4. 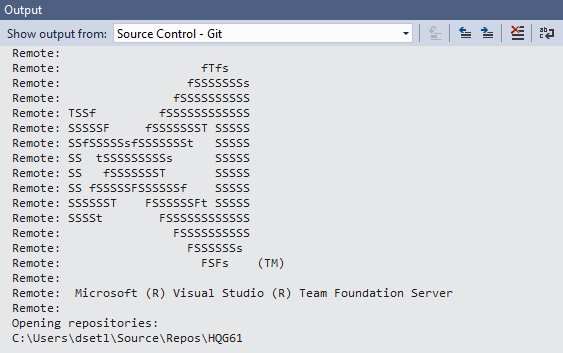 Navigate to your Git install directory and locate the ca-bundle.crt file. Make a copy of this, and move it to a different directory that is accessible from anything on the machine. It can be under /users/ or simply create a ‘DoD’ directory under the location to move the copy to. Depending on the client you use, and version, the install directory may change. Once you have a copy of the ca-bundle.crt, using a tool like unix2dos, reencode the file so that it can be opened. 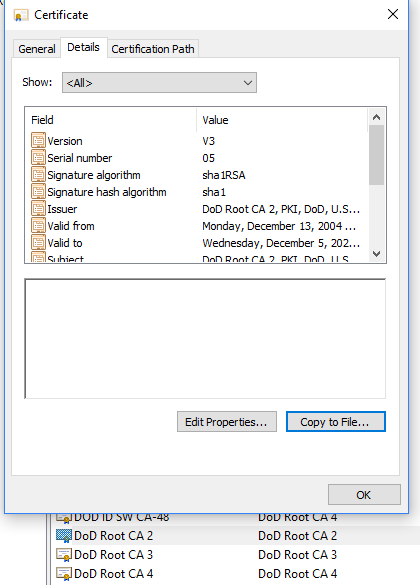 After this, open up each of the exported DoD Root Certificates in Notepad. Copy and paste the hash into the ca-bundle.crt file, one after another, at the end of the file. The total size should be 254kb. Once you have the completed ca-bundle.crt, move it to the appropriate location where it will be accessed. A list of configurations will print out. Restart any open clients and try to clone or push against a repository secured by a DoD certificate. 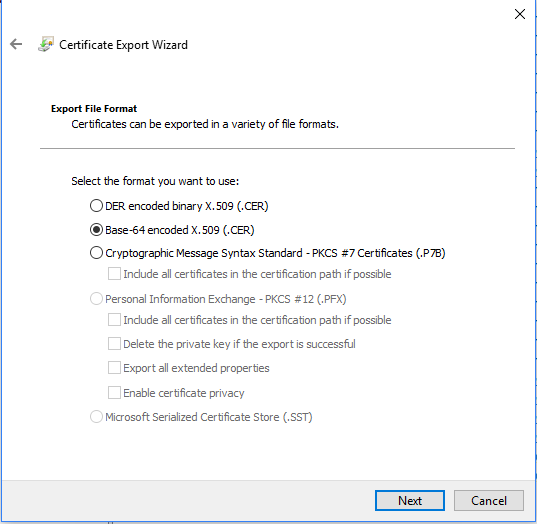 Please keep in mind that any time a new DoD root certificate is issued, this process will need to be repeated to add that certificate. I will make it a habit of also updating the repo above. 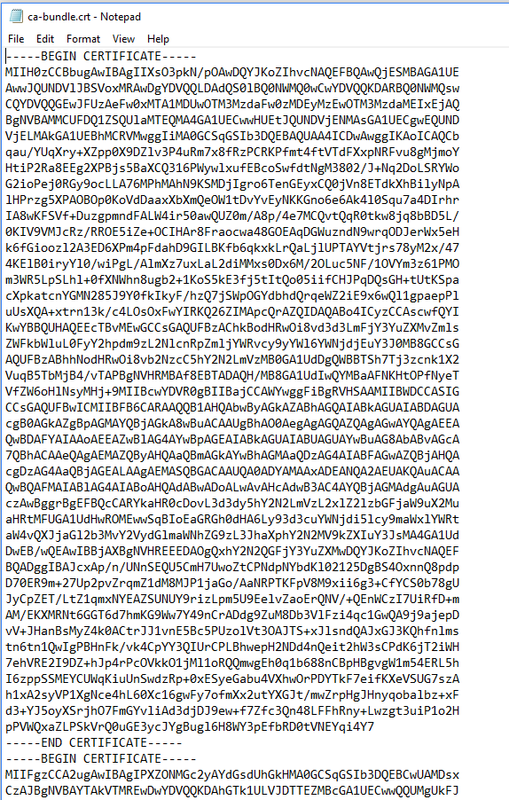 Often times, after this is completed, authentication will still fail but with a different error. Navigate to ‘Credential Manager’ in Windows 10 (Search for Credential), select ‘Windows Credentials’. Look under ‘Generic Credentials’ for the TFS or other source control site, and remove any entries found there. Restart the build agent and try your build again.